We travel to Greece every year and so far this was the best accommodation we discovered all these years. The owners were extremely nice and helpful and the apartment was just amazing, equipped with everything you need , clean and tastefully decorated. Also the views were fantastic. We never had an apartment so close to the sea. Sleeping while hearing the waves was extremely relaxing. The apartment was 10 minutes away by car from the nicest beaches in Kassandra. We will definitely return to this amazing place. Wonderful position next to the sea (you can hear the noise of the waves from your bed), nice beach at 2 minutes of walking distance but if you prefer organized beach you need no more of 5 minutes of walking. The owner Joanna is very kind and helpful. Wi-fi exceptional. The kitchen is well equipped. In the garden you find outside shower, sun beds, a patio, a barbeque area with basin, and table. It is nice and quiet place. The hosts were very kind. Everything was fine during our stay. I recommend the place. Ήταν ολα παρα πολυ ωραια πολυ φιλόξενοι άνθρωποι πολυ ευχαρίστως θα ξαναπάω ολα πεντακάθαρα το διαμέρισμα παρα πολυ ωραίο έχει θεα θαλασσα εινα δίπλα στη θαλασσα και η θαλασσα εκεί ειναι πεντακάθαρη με πολυ ωραια τιρκουάζ νερά και μέσα έχει όλο άμμο !! Ήταν ολα τελεια !!! Lock in a great price for Seaside 1 – rated 9.8 by recent guests! Seaside 1 is set in Agia Paraskevi. 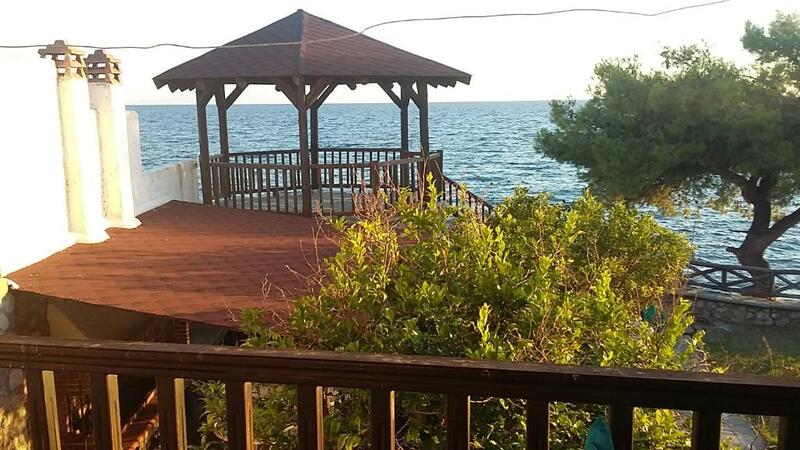 It has barbecue facilities, a garden, sea views and free WiFi. The holiday home includes 1 bedroom and a kitchen with an oven and a coffee machine. The air-conditioned holiday home also provides a flat-screen TV and a bathroom with a shower. Sani Beach is 19 mi from the holiday home, while Vourvourou is 30 mi from the property. Thessaloniki Airport is 52 mi away. When would you like to stay at Seaside 1? House Rules Seaside 1 takes special requests – add in the next step! Please inform Seaside 1 of your expected arrival time in advance. You can use the Special Requests box when booking, or contact the property directly using the contact details in your confirmation.